(TORONTO, ONTARIO – July 12, 2017) A Japanese partnership, consisting of the Kanagawa Prefectural Government, the municipal governments of the cities of Yokohama and Kawasaki, Iwatani Corporation, Toshiba Corporation, Toyota Motor Corporation, Toyota Industries Corporation, Toyota Turbine and Systems, Inc., and Japan Environment Systems Co., Ltd. announced today that all facilities to be used in the FY2015 Regional Cooperation and Low-carbon Hydrogen Technology Demonstration Project commissioned by the Ministry of the Environment have been completed, and full-scale operations have commenced. 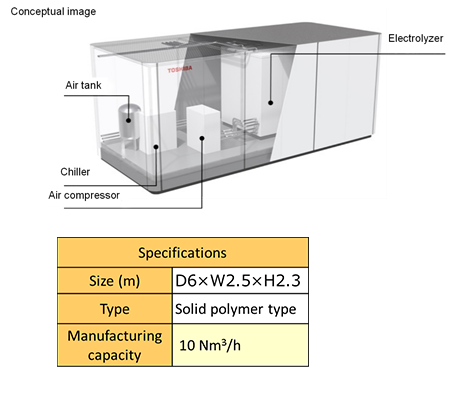 The goal of the project is to implement and evaluate a low-carbon hydrogen supply chain which will utilize hydrogen produced from renewable energy in facilities along Tokyo Bay (in Yokohama and Kawasaki) to power forklifts. 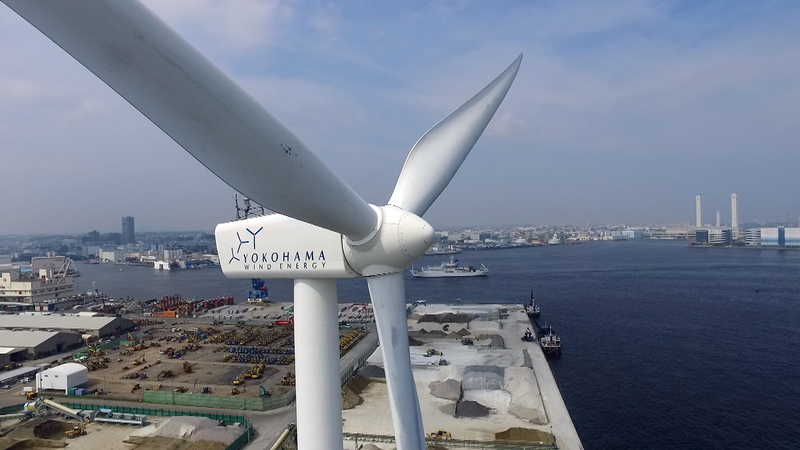 A system has been created for using electricity generated at the Yokohama City Wind Power Plant (Hama Wing) to electrolyze water to create low-carbon hydrogen, which is then compressed and stored. The hydrogen produced at the site will be transported in a hydrogen fueling truck to a fruit and vegetable market, a factory, and warehouses. The hydrogen will be used in fuel cells to power forklifts at these locations. The creation of this hydrogen supply chain in cooperation with local partners is expected to reduce CO2 emissions by at least 80 percent when compared with a supply chain using forklifts powered by gasoline or grid electricity. 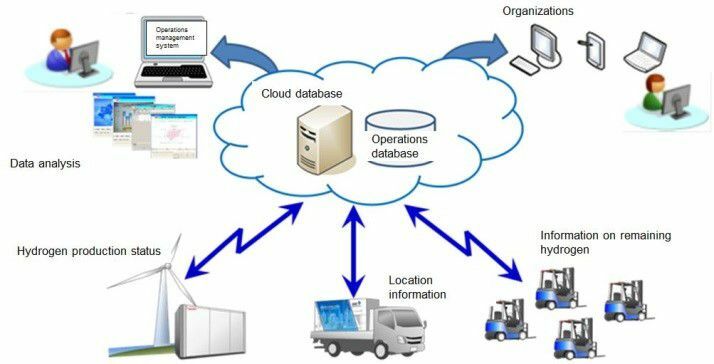 The goal of the project is to establish a hydrogen supply chain, analyze costs, and estimate potential CO2 reductions that can be achieved with a full-scale supply chain in the future. The business case for hydrogen supply chains and future expansion to other regions will be verified, through cost analysis and measurement of the project’s contribution to global warming countermeasures. The demonstration project will use evaluations of current conditions (demonstration project costs) to examine future courses of action required to reduce hydrogen costs, including verification of savings from economies of scale and identification of the steps needed to implement deregulation. The project will also examine the development of a promotional and deployment model through technological innovation, as well as the development of full-scale supply chains, based on projections of needs in 2030. The project aims to construct a low-carbon hydrogen supply chain that can reduce overall CO2 emissions by at least 80% when compared with conventional approaches. The project will examine measures for further reducing CO2 emissions. Model of Hama Wing site premises (Japan Environment Systems) Co., Ltd. Note: Factors such as future discussions with the Ministry of the Environment may cause changes to the demonstration details and implementation plan. One forklift was deployed to the Yokohama City Central Wholesale Market and one to Nakamura Logistics for test runs. A hydrogen fueling truck from the Iwatani Industrial Gases Corp. Chiba plant was used to deliver hydrogen. 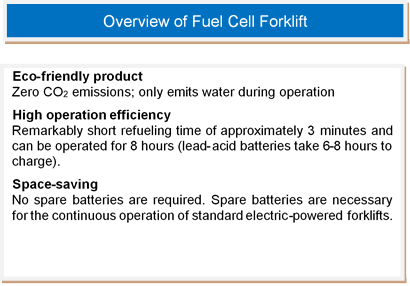 Compared to forklifts powered by electricity, fuel cell forklifts had shorter recharging times, were used flexibly without issues, and were generally well reviewed. 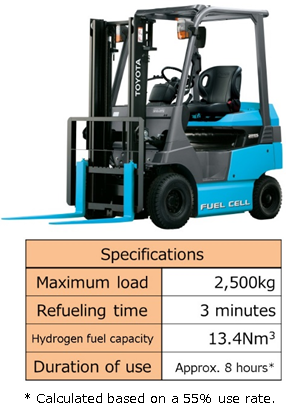 There were requests for more frequent hydrogen deliveries in order to improve fuel cell forklift uptime. 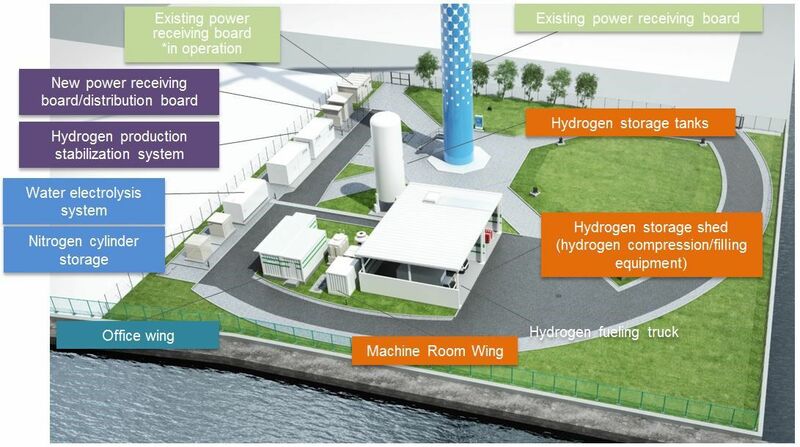 Hydrogen will be produced through a water electrolysis system powered by renewable energy generated at Hama Wing. 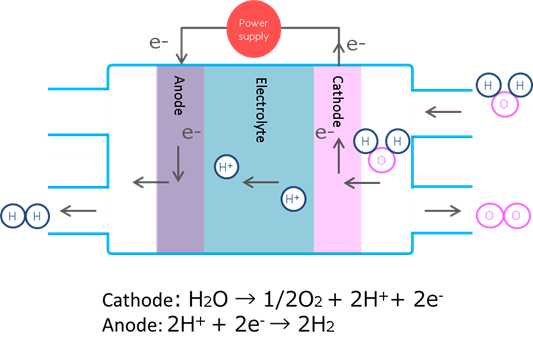 The management system will enable flexible, low-carbon hydrogen production that accounts for temporary discrepancies between power output and hydrogen demand. 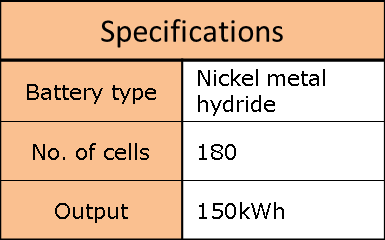 Sufficient hydrogen to power fuel cells for two days will be stored on-site. 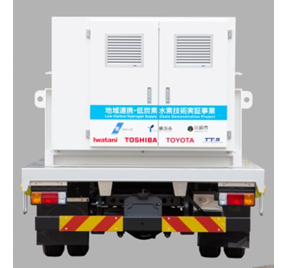 Electricity will also be stored in an environmentally friendly storage battery system that re-uses batteries from hybrid vehicle batteries, thus ensuring a stable hydrogen supply even when Hama Wing is not operational. The hydrogen will be compressed for use in forklifts and delivered in hydrogen fueling trucks (the first of their kind to be used in Japan). The consumption of hydrogen by the forklifts will be continuously monitored, so as to ensure optimal transportation and supply to meet user needs. Twelve forklifts will operate at the four selected locations to demonstrate their viability in a range of operating conditions. 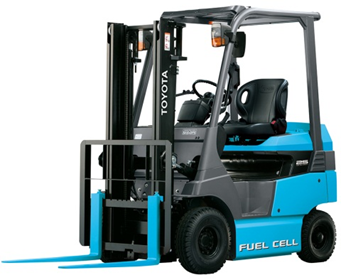 Fuel cell-powered forklifts, which Toyota launched in November 2016, emit zero CO2 during operation.